Lady Gaga surprised her little monsters in the audience and around the world with a surprise appearance at the MTV Movie and TV Awards. While clips played of her documentary Five Foot Two, which won the prize for Best Music Documentary at the award show, Tiffany Haddish handed the singer her golden popcorn statue. Directed by Chris Moukarbel, the Netflix documentary follows the Grammy winner in the year leading up to the release of her 2016 album, Joanne. The A Star Is Born actress, 32, went on to present the award for Best Movie. “The real reason that I am here tonight is to present the award for Best Movie. The five films nominated this year filled our spirits, broke our hearts, broke the box office and led us on shiny-starred adventures that we are still coming down from,” she said. She then announced the award would go to “Black mother f—– Panther’. 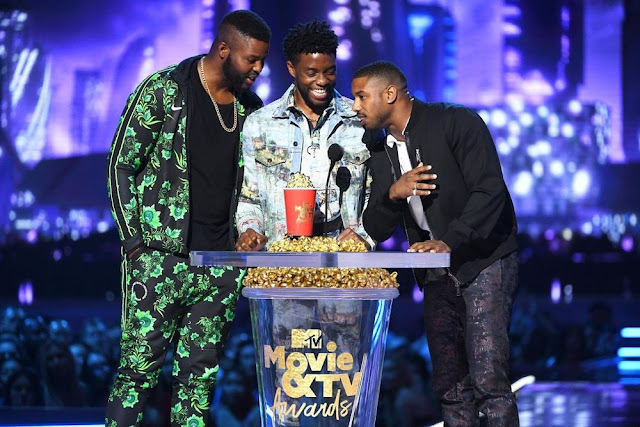 The film, starring Chadwick Boseman as the superhero and Michael B. Jordan as the villain, grossed over a billion dollars worldwide.